They may be miles apart but the theme was the same in both Frazee and Barnesville. 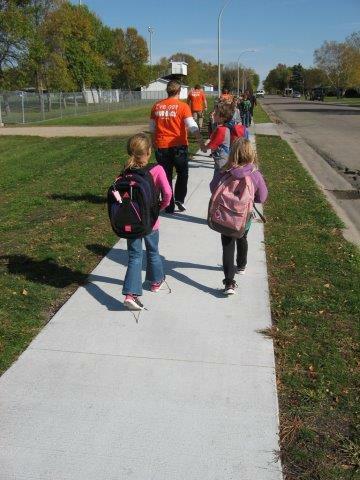 Both communities held International Walk to School Day events on brand new amenities that came about due to the Safe Routes to School planning efforts of West Central Initiative. 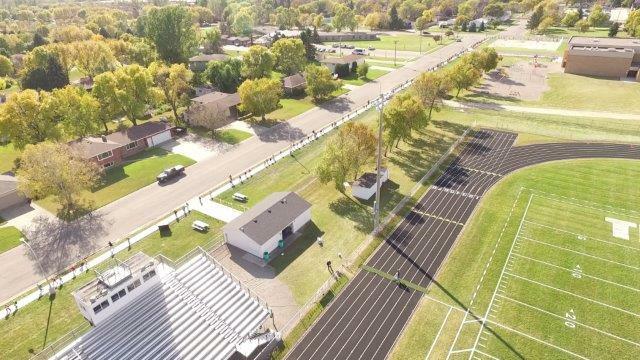 In Frazee, it was a new multi-use trail that connected the school with a neighborhood on the edge of town. And in Barnesville, it was a new sidewalk in the heart of town just south of the football field. The weather was brisk but sunny as students from both the elementary school and high school were rustled up to go on an invigorating morning walk. But this was more than just a wake-up exercise. Frazee was celebrating the completion of a vitally important new connection to the school and the rest of town from a new neighborhood on the northwest edge of town. Figure 1 – Students walk along the new section of trail that runs through fields next to the school. The streets of the new neighborhood don’t provide a good walkable connection to the quiet neighborhood streets in the older part of town, and students had to cross a highway with no sidwalks to reach school. Speeding on this section of roadway is always a potential problem. 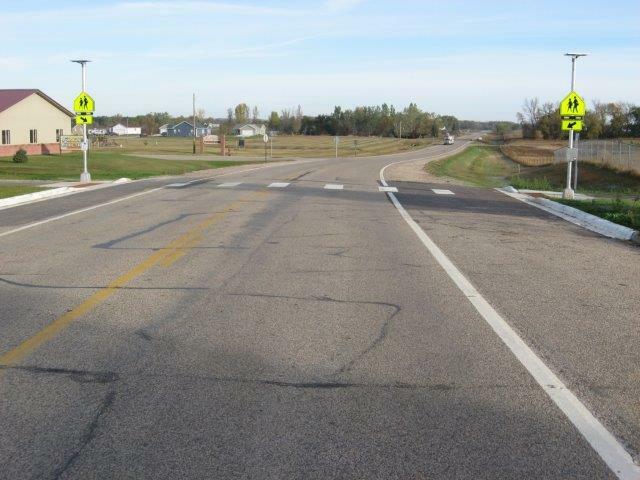 All of this was identified by WCI in a Safe Routes to School Plan done at no cost to Frazee through a Minnesota Department of Transportation (MnDOT) grant. The solution suggested by WCI staff was to run a trail through a right-of-way. Since this a somewhat busy entrance into town, engineers working off the WCI plan felt that a Rectangular Rapid Flashing Beacon activated by walkers pressing a button at the intersection would do an effective job of warning drivers when people are actually crossing the roadway. From there the trail runs through a field just west of Frazee Elementary School and terminates immediately adjacent to the elementary school. The students had a good time walking the new pathway and then returning on the roadways (with police, parent and teacher supervision) they now can avoid. Frazee Mayor Hank Ludtke was clearly enjoying the moment of seeing this project coming to fruition. Not only will students living in the new neighborhood have a safe and convenient way to school but the trail will serve all residents looking for a place to walk or bike in town for both work and pleasure. Figure 3 – Mayor Hank Ludtke, far right, with the ceremonial scissors just after the ribbon cutting. Figure 4 – Students walk on the shoulder of County 27 with police, parental and teacher supervision. The new trail allows them to avoid this section of roadway. 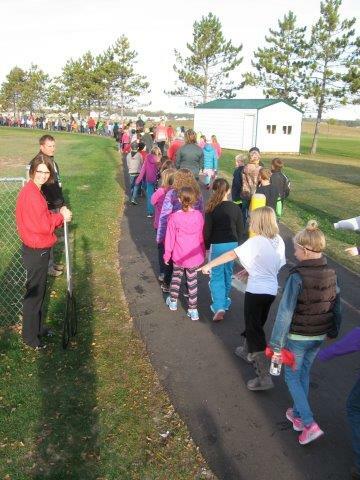 The Walk to School Day activities in Barnesville were in the afternoon right before the students were dismissed. 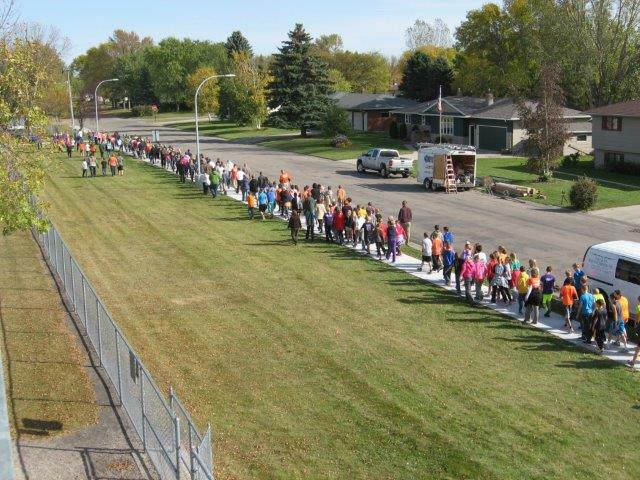 Here, too, all students K-12 walked on a new section of sidewalk recently built after observations led by WCI found that students walking on 5th Ave SE next to the football stadium were walking in the street and on the grass. 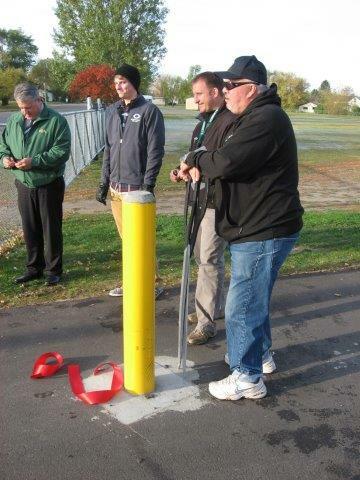 Since this was identified by WCI in their Safe Routes to School plan, Barnesville was able to apply for a Safe Routes Infrastructure Grant to upgrade sidewalks around the schools, and to build a new sidewalk next to the football stadium, complete with lighting. The activities in Barnesville were not as formal Frazee but equally effective. 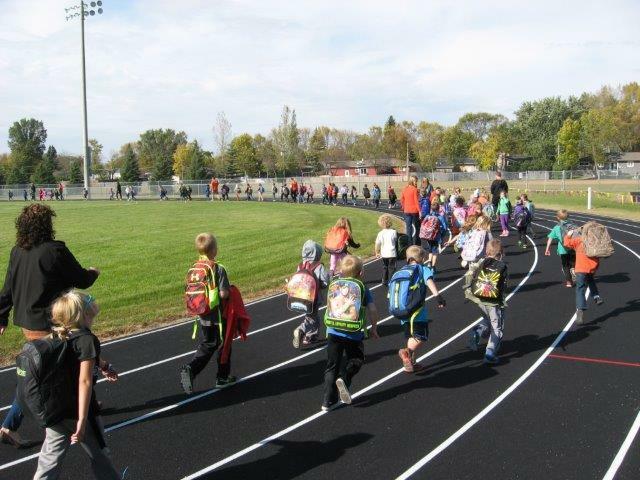 The high school students walked over to the elementary school and all students first walked on the new sidewalk and then returned to the school on the track in the football stadium. For this event there was a special treat. 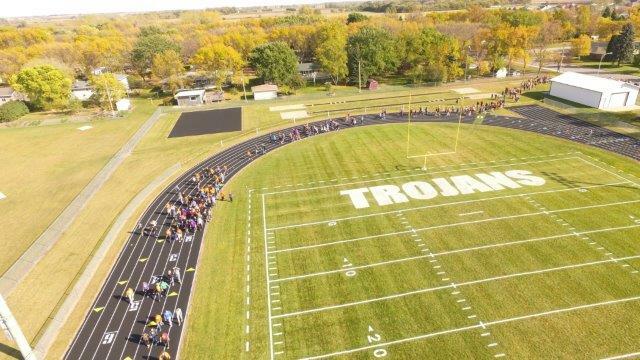 Casey Ehlert, Barnesville Public School’s technology coordinator, flew a drone to capture images of the event. A nice surprise at the end of the event was the large number of students riding their bikes home from both the elementary and high schools. Dozens of bikes were waiting for their owners to ride them home. This is great to see as not only are the children getting exercise but they’re learning that bikes can get them places quickly and easily, building independence and self reliance along the way. 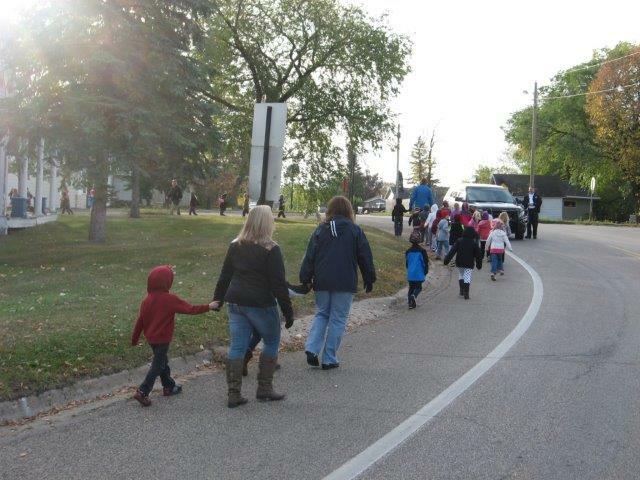 The Walk to School Day events in Frazee and Barnsville were repeated in a number of communities in Minnesota and across the west central region, including Detroit Lakes, Rothsay, Hawley, Dilworth-Glyndon-Felton, Alexandria, Glenwood and Starbuck. If your community is interested in a Safe Routes to School pPlan or a Walk to School Day event, please feel free to contact, Andrew J. Besold, the transportation planner at West Central Initiative (andrew@wcif.org). He will be glad to help you out! 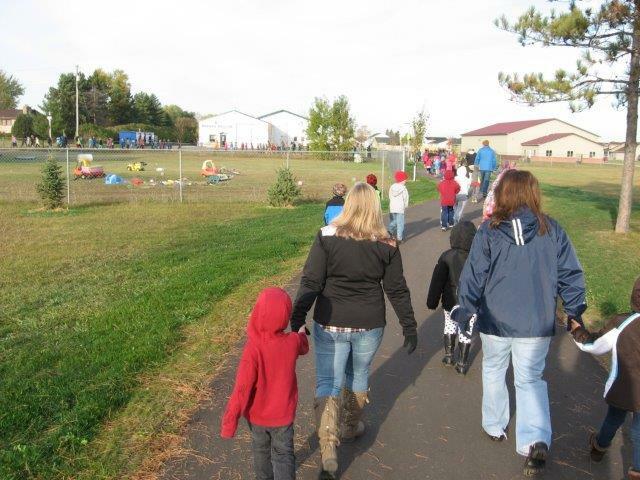 Figure 5 – Nice wide sidewalks allow students and adults to walk side by side without needing to walk in the grass. Figure 6 – Drone cam of students walking on the new sidewalk. 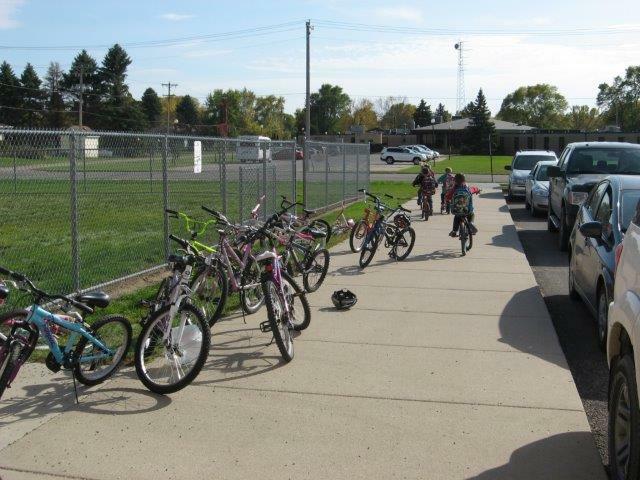 Figure 7 – Elementary school students riding their bikes home from school, with plenty more awaiting their owners.